You don't need to look hard to see how the Global Times - the state-backed Chinese newspaper - is interpreting the arrest of Huawei chief financial officer, Meng Wanzhou. "Washington's move to stifle Huawei will undermine itself," reads a headline. "Banning Chinese companies like Huawei will isolate US from digital economy of the future," reads another. It's that second headline, the threat of isolation, that should give US technology companies considerable pause as we head into Ms Meng’s 12th day of detention in a Canadian jail. The Global Times said: "Some Western countries are resorting to political means to resist Huawei's attempts to enter into their markets. China has long felt that the US is unfair to its big tech firms - in particular Huawei, which is the closest thing the country has to a true Apple competitor. While it doesn’t (yet) come close in terms of yearly revenue - $266bn for Apple against an expected $100bn or so for Huawei - the firm did manage to leapfrog Apple in global smartphone sales earlier this year. Huawei is now second only to Samsung. "The last thing tech investors wanted to see was this news about the CFO of Huawei,” Mr Ives said. 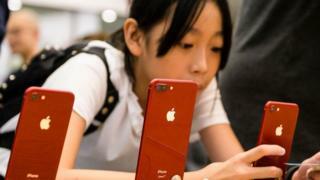 But there is one aspect of Apple’s success in China that could mean it's spared Beijing’s wrath - even if Ms Meng finds herself extradited and even jailed. Apple of course doesn’t just sell products to China, it makes them there. In 2017, Apple estimated that between manufacture, retail, distribution - not to mention those developing for its software - it was responsible for 4.8m jobs in China. "They have relationships with the Chinese government because they’ve been a massive employer,” Mr Ives said, suggesting Beijing might be limited in what action it could take as result. "By hurting Apple, it would to some extent be almost like burning down your own house."